The Oil Disc Skimmer is mainly composed of the hydraulic power station, skimmer head (the main unit), hydraulic oil hose and oil pipeline. 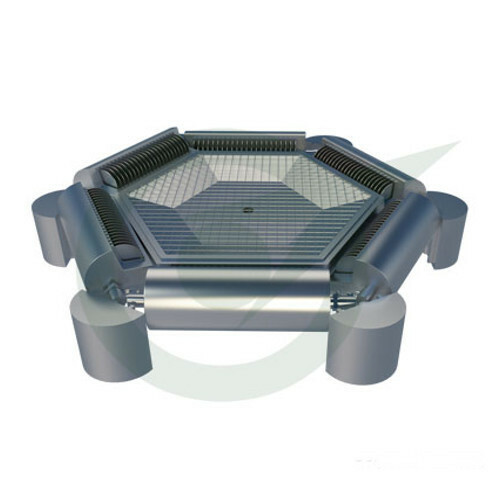 It is applicable to recover oil spills of various viscosities. It can be widely used for the recovery of oil spills on ocean, rivers, ponds and other areas. The power station operates with the hydraulic oil pump and the oil delivery pump driven by a diesel engine or motor; the main unit is composed of the disc unit, oil collecting channel, buoy and other parts; the main unit floats on the water surface; the power station is located on a boat or bank. The skimmer head floating on water is made of the corrosion resistant glass fiber reinforced plastic, stainless steel or the marine – grade aluminum alloy. It can be used for the recovery of oil spills on waters. It has a solid and endurable structure. The buoy is filled with foams to secure a duai – buoyancy. The disc skimmer can recover lubricants, fuels, vegetable oils and other flowable oil spills of low and medium viscosity. The disc's rotating speed can be adjusted with a step less speed regulation according to the conditions on the oil spill site to reduce the water content of the recovered oil spills. Leveraging on our vast experience, "Star Trace Private Ltd", established in 1998 is actively engaged in manufacturing and supplying a vast array of Industrial Machines. Our remarkable range encompasses Stone Crusher, Pulverizer Mill and Crushing Plant. These products are manufactured using optimum quality raw material that is procured from the most authentic vendors of the market. Our products are extensively used in various industries namely Agro, Pharmaceutical, Ceramic, Detergent & soap, Dairy and Fertilizers. We are able to make our presence globally felt with the quality products, on time delivery, competitive prices and customer centric approach. We have employed a dexterous team of professionals, which greatly supports us in offering an impeccable array of products to the clients. The products offered by us are manufactured at our robust infrastructure that is installed with advanced technology and high-tech machinery. Furthermore, post-production, these products are stringently inspected by the quality controllers on certain parameters of quality so as to ensure their flawlessness. Apart from this, to ease out the tedious process of monetary transactions, we accept payments via various convenient options. Owing to these reasons, we have been able to muster a huge clientele for ourselves across the nation.